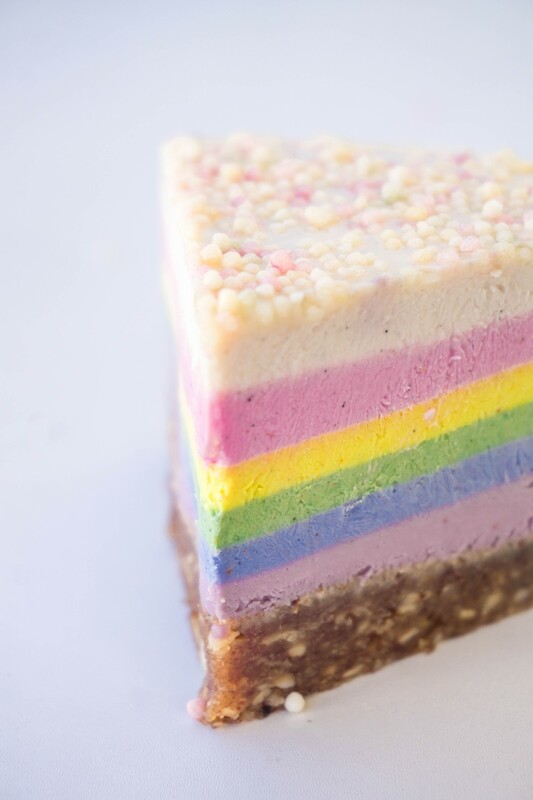 When people tell you to eat the rainbow – why not do it in the form of this stunning Rainbow Cheesecake? 😉 You know I’m not a fan of nasty artificial stuff and always try to keep my desserts as healthy and wholesome as possible and this beauty is no exception! It is 100% dairy-free, refined sugar-free, colored with natural superfoods and even oil-free! This is such a stunner for special occasions and, in particular, also for children which is why I made it as allergen friendly as possible. I never understood why all those child-marketed sweets out there are so unhealthy. It’s like giving poison to your kid, making them addicted to refined sugars and fat from very early on! 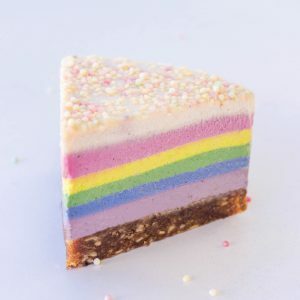 I’ve experienced quite a while with the texture of this rainbow cheesecake as I wanted to avoid the huge amounts of coconut oil that most raw vegan cakes are filled with. And I gotta say – it turned out a complete success! This cake is as creamy as it gets and not only very pleasing for the eye but actually tastes amazing! It really came out perfectly and was such a HUGE success with everyone who tried a piece! It’s really just amazing when you think that these colors and tastes are achieved by only plants! Can you believe that this cake is in fact all naturally colored with different superfood blends made from vegetable roots, fruit, spices, flowers and even algae (don’t worry you don’t actually taste them)? 😉 I’d go for the extra health boost and beautiful colors every single time before I’d buy any of those artificial supermarket food colors. 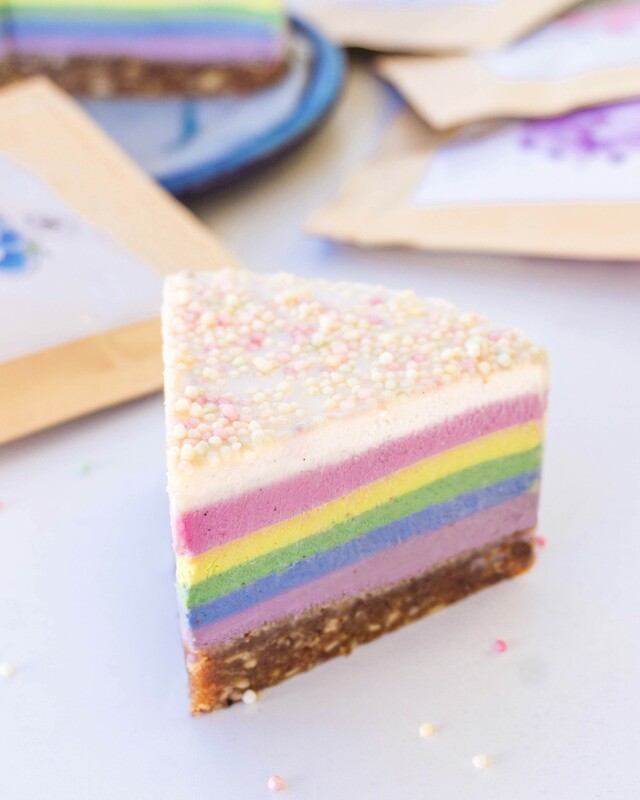 For this Rainbow Cheesecake I have worked with 5 different superfood powders of theirs: berrylicious blend, tropicana blend, ocean blend, alkalising blend and their pitaya powder! I could have even added another layer of red with their antioxidant blend if I wanted to get all the colors in! 🙂 Their powders are absolutely fabulous and such a fun way to experiment with plant-based colors while adding some extra vitamins to your creations! Now, I gotta say – if you’re not a fan of coconut/cashews you might want to skip this recipe! As most raw cake recipes out there the creamy cheesecake-like texture is achieved through a combination of coconut milk, cashews, and coconut butter (NOT oil) with some few extras like vanilla and lime to achieve that tangy aftertaste. I was actually quite surprised how the addition of coconut butter took away all the ice crystals that you usually get when making oil-free raw cakes. 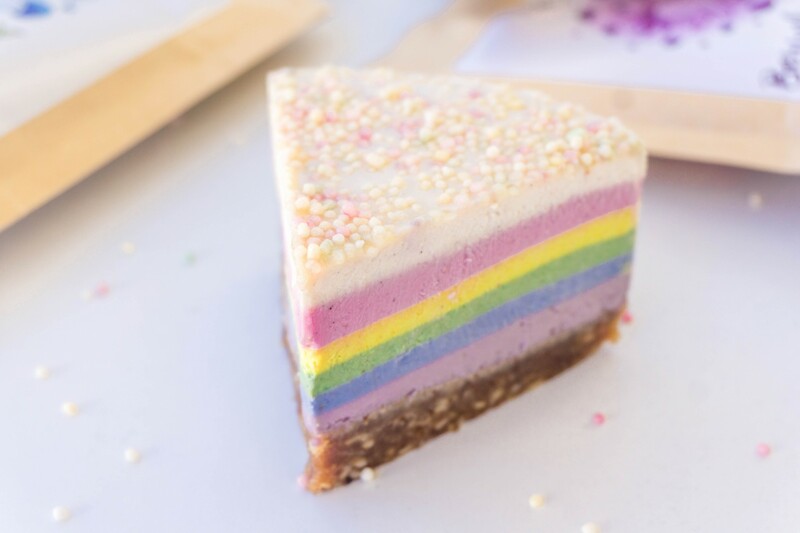 It even holds completely firm in the fridge which is really not a given and one of the reasons that I’m SO please with this new rainbow cheesecake! 🙂 It took me a while but eventually I managed to create the perfect wholesome vegan cheesecake without any nasties! Oh – did I mention already that it’s also gluten-free? 😀 The crust is made from a combination of walnuts, almonds and the best Medjool dates you can get your hands on in Europe. 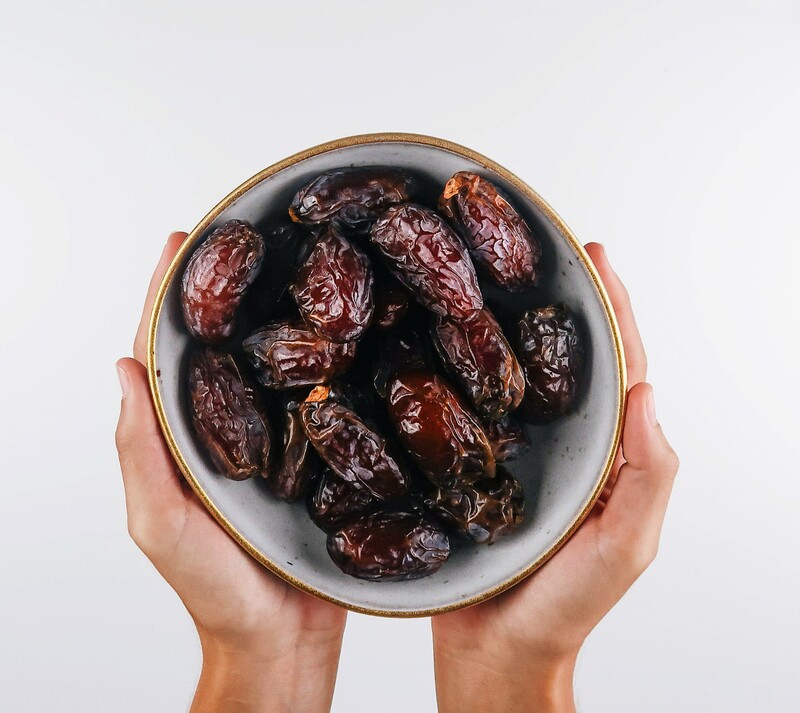 If you’re struggling to find those juicy high quality jumbo dates in Europe check out KORO – they have a German, UK and French online shop and deliver all over the EU. And if you wanna save a little bit use ‘THETASTYK’ for 5% off! I’m getting a box of their’s delivered straight to my doorstep every month with all the best wholesome vegan goodies! Line the bottom of a 20cm round cake tin with parchment paper. Add all your crust ingredients into a food processor/high speed blender and pulse until you get a sticky dough. Place the dough into the cake tin and use your fingers to press down evenly. Place into the freezer to chill. For the filling simply add all ingredients to a high speed blender. Blend on high for 60 seconds until completely smooth. Divide the filling equally into 6 different bowls. Add about 1 tsp of the 5 UnicornSuperfood blend to each bowl and blend each layer separately (make sure to clean your jug in between). Pour the first layer onto the crust and use a spoon to even out the filling. Place into the freezer for min. 30 minutes until firm and repeat this step with all the other layers. Finish with a final white cream layer and add some colorful sprinkles/colored desiccated coconut/other decorations on top and freeze for another 3-4 hours (or overnight). Carefully remove the tin and let it thaw a bit before cutting into pieces. Store in the fridge for 3 days and freezer up to 2 months. What are the sprinkles on top? 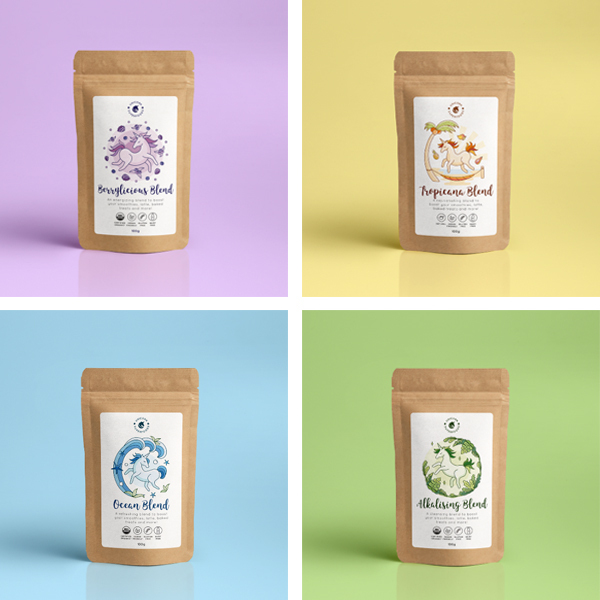 You could try using turmeric powder for yellow (just gotta be careful as the taste is much stronger and you don’t want the taste to be affected that much), blue spirulina for the blue, barley grass/spinach for the green, blueberries/acai for the purple, beetroot for the pink! 🙂 I mean that’s what the powders are made from essentially, just not so concentrated so they don’t affect the taste that much because they’re blends made from a few fruits/veggies at a time. Price wise it’s more or less the same like buying acai, spirulina or other ‘superfood’ powders but I totally understand how that’s not affordable for everyone. Don’t you use a food processor for making the crust?